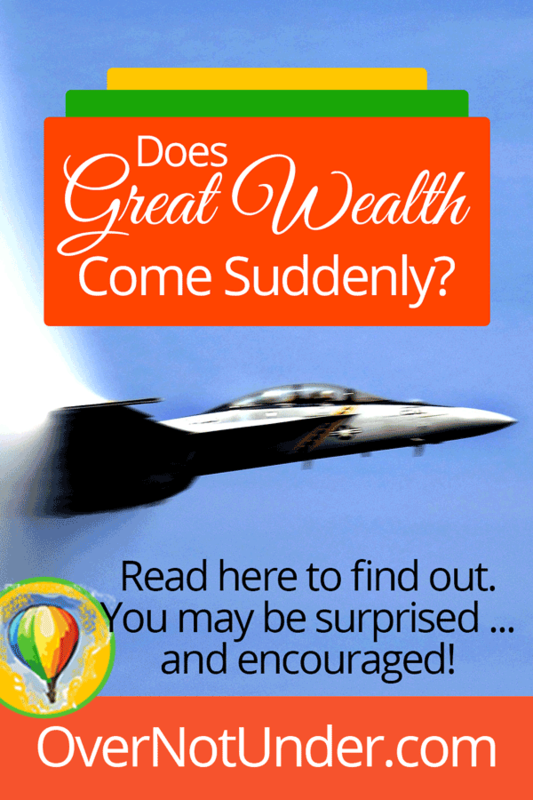 Does Great Wealth Come Suddenly? I recently received a letter from a precious reader asking me for advice. She was questioning herself and her faith in God’s promises. She was wondering if she might have imagined the promises she had been believing in. This reader had a radical encounter with God one day. During that encounter, God promised her great wealth. She believed Him and thanked Him. She was overwhelmed by His glory, and she worshipped God. But then her family discouraged her. Her family didn’t believe and didn’t agree. So now, she is left wondering if she imagined the whole thing. Dear sister, you did not make it up. God promises great wealth in His Word. And if it’s in the Word, it’s for you. And if God promised it to you, He will fulfill that promise. Now I want to talk about the hows and whys and whats about this subject, knowing full well that some people will be able to receive it, learn, grow, and reap the benefit from God’s promises. Other people won’t receive it. But I hope that you, precious reader, will be in the former group. First, know that God does often move suddenly to bring wealth to people. HOWEVER–and I did write that in all capital letters for a reason–God’s definition of “suddenly” looks NOTHING like our definition of “suddenly.” God’s definition of suddenly always has a precursor to it. The disciples gathered in the Upper Room after the Ascension. They prayed for fifty days. Then, suddenly, God poured out His Spirit and baptized them all in His Spirit and fire … and the Church was born. Abraham believed God to send him a baby boy for decades and decades. He was faithful to steward the promise and believe God. Then, suddenly, Sarah was pregnant. The Jews prayed for the Messiah to be born for four thousand years. Then, suddenly, Christ was born of the virgin Mary. God’s suddenlies often take time to get here. But, when they do, they happen QUICKLY. That is a HUGE key to wealth. Pay off all your debts and don’t incur any more, ever. Know where your money is going. Every month, every dollar/pound/euro/peso. Every one. Make a zero-based budget (where you tell every dollar where to go, down to the very last dollar, every time you get paid) and follow it. Invest and save as a priority (but tithe first and foremost if you’re a Christian). Live frugally; cut out every expense you don’t absolutely have to have in your life (cable TV, I see you), and save, save, save, and invest, invest, invest. Note that I am not an investment expert or a financial professional, yada yada, talk to your tax advisor, etc etc. I am just sharing practical wisdom with you here. Save at least 3 months of living expenses in actual, readily-available, liquid, cash money in the bank. Figure up how much it would take you to pay all the bills for 3 months, and make that your goal. Get it in cash in the bank. Then keep saving until you have a full 6 months of living expenses in liquid money in the bank. PUT THIS MONEY IN A SEPARATE ACCOUNT THAT YOU DON’T USE EVERY DAY. Not your checking account. Put it where you can get it if you have to, but DON’T TOUCH IT except for emergencies. It’s your EMERGENCY fund. And no, buying that new sofa that’s on sale at the furniture store is NOT an emergency. Hands off your emergency fund; sit on the floor if you have to. And get out of debt. Get out of debt. Pay off every single debt. Do what it takes. Sell your dog, your house, your jewelry. Deliver pizzas on the weekend. Wait tables in the evening. Do what it takes to get out of debt. CUT THE CABLE BILL. Downgrade your cell phone. Do what it takes to get financially stable. And do it quickly. Pull out all the stops. I read stories all the time about people who built great wealth quickly by getting really, really intense and serious about their finances. I mean, within one or two years, they paid off debts, saved massive amounts of cash, and invested heavily. They just cut out everything and made this their project for a short period of time–and it paid off. If you wait to get your finances in order–or if you do it slowly–you’ll lose interest. DO IT NOW, and DO IT FAST. Momentum builds encouragement. Seeing progress generates more progress. Psych yourself up by getting financially stable fast. Then invest in mutual funds. Don’t buy or collect stuff; buy and collect mutual funds. Start a business also if you feel led. Owning your own business is the primary receptacle that I read about in the Bible for receiving wealth from the Lord. If you do these things, chances are that you will become very wealthy rather quickly. But you know what? It is essentially required of a steward that a (wo)man be found FAITHFUL. So if God is going to bless you with great wealth, He expects you to steward what you have first. And along the way, as you steward what you have by doing the above, you will increase more and more. So does God give great wealth? YES. Throughout the entire Bible, God promises great wealth. He says that we have to obey Him, love Him, and honor Him–but if we do, He will bless us in every way. INCLUDING FINANCIALLY. He does give great wealth. And He gives it suddenly. Suddenly, after years of paying off debt, you find that compound interest worked wonders in your retirement account and you’re suddenly a half-millionaire. Suddenly, after a few years of showing up at 4 AM to work on your business, or 6 PM or 10 PM or 2 AM, you have a good cash flow from your business and you find yourself employing other people and being a blessing to the Kingdom. Suddenly, after months of being faithful to pay off debt, you look around and realize that EVERY. LAST. DEBT. IS. GONE. And suddenly, you notice that you’re wealthy. Because He promised, and He cannot lie. His Word cannot return void. Because He wants you to have nice things and represent your royal status as His child well. Because He wants you to give to the Kingdom. 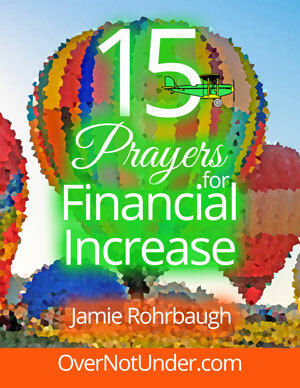 Because He wants you to use His finances to INCREASE THE INHERITANCE OF JESUS. And to do all those things, you need wealth. You need to receive wealth, make wealth, generate wealth, give wealth, and compound wealth. God has called every Christian to be wealthy. Most will not answer the call, but some will. Some will believe Him and will not scoff. Some will see His bigger plan for the earth, and their place in it, and will see how wealth is required to make those things happen. Some will become willing participants in His Kingdom plan to spread the Gospel, for which wealth is required. Some will put in the work it takes to be very wealthy. Some will prepare their baskets and their kneading troughs so that they’ll have something to receive their wealth in. (If you have nothing to carry it in, you can’t receive much of what God is pouring out.) Some will believe and stand on the promise while they do everything they can to shape their finances into the level of wealth God’s Word prescribes. I believe you will, but you need to say it and decide it for your own good. If you will be one of them, confess it out loud and then leave a comment below! I love this word Suddenly glory be to God I know my suddenly moment will come preise be to God . Hi Jaime hreat response.I moved to another province in Canada for school and cannot find a job.I applied and went to 3 interviews and was turned down.I cannot tithe..or even pay bills.I may take 10 bucks out my rent money thats bring provided by my parents to throw in church.Im unemployed and waiting on God to bless me with a job.He has sustained me but Im ready to be blessed.Any advice? Hi there! My advice would be to apply for every job you can find, no matter how menial the work. Maybe even 3 or 4 jobs. That’s what I’ve had to do before, and it was worth it every time. But this season is not forever! Just do what you can for now. Amen!!! I believe and receive this word!!! Here’s something else that makes us rich. Giving to those that are truly in need (natural disaster (tornado, hurricane, fire, etc victims; paying for children’s lunches at school, helping the elderly, etc). From the smallest to the largest. It sure does make you feel rich. 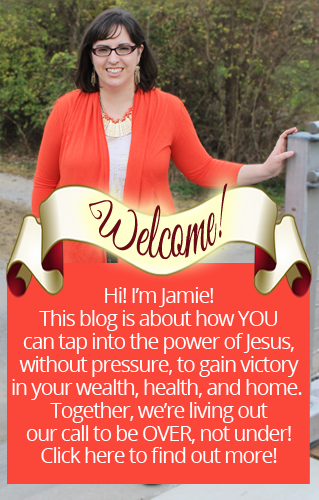 I receive this word and declare hereby that SUDDENLY am one wealthy woman in Jesus’ Mighty Name! Amen!